More friends and a blog: Slow and, ahem, steady wins the race? Slow and, ahem, steady wins the race? Just so my friends don't completely give up on me as a knitter. Here is a picture of a project of mine. Here's my excuse as to why these socks are taking so long. 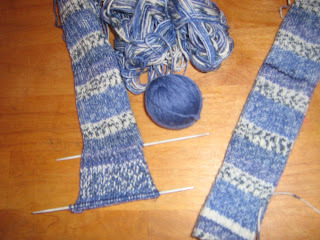 :-) I wanted to do the heel and toe with a double strand of yarn and I wanted the second strand to be a solid colour. Since I am only using thrifted yarn, I had to dye the white yarn to match. Yes, that sounds like quite a reasonable excuse, doesn't it? Now, that I no longer have an excuse I guess that means that they socks should be done post-haste. From someone who has been working on the same socks since last summer, I think your pace is fine. I'm a binge knitter, I think. When I get excited about a project there is no stopping me from getting it done but then I go into a relax mode where I only pick up the needles around other knitters.